Info: -Yellow Fuji Feather (2012’s model). Slip-on white grips on chrome drop handlebar. White seat. Front & rear break setup.-Purchased from a store called ‘Bikes on Wheels.’ It has a b&w ‘Bikes on Wheels’ sticker (circular eagle emblem) on the top side of the bottom of the frame (beside the crank). Where/When: Locked from the frame to scaffolding outside the Bedford subway station, with a Kryptonite (Evolution) Mini U-Lock, red & black (40th anniversary edition). Stolen between the hours of 12:00pm-3:00pm on Sunday, January 12, 2014. Contact: Call/text: 347 260 9452 with any information (or email nick.partyka). Cash reward. Thanks for the site and the NYC bike community. You all rock. 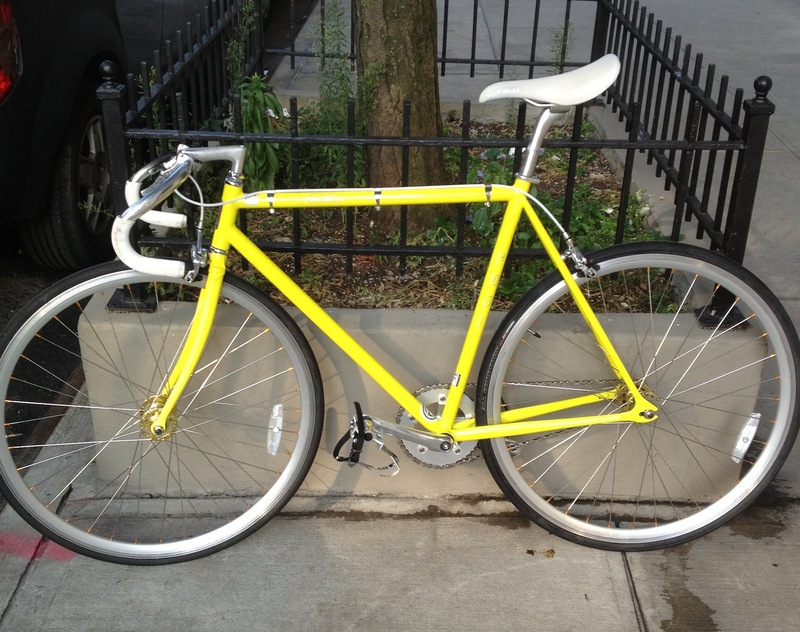 dont know if this is yours in the ad but i remembered seeing a yellow fuji feather here on bikewatch.